Heart disease is the leading cause of death in women and heart attack is the leading cause of hospitalization. The characteristics of this disease in women may differ from those known in men; the age of onset, presence of risk factors, probability of aggressive diagnosis and treatment vary in men and women. For example, heart disease develops 7 to 10 years later in women than in men (potentially because of a protective effect of estrogen). Heart attack (myocardial infarction, MI) is less frequent in young women than in men, but young women with heart attack are at greater risk of dying within 28 days of the attack. Common risk factors for heart disease have similar predicting value both for men and women; however, men more frequently have smoking as risk a factor, whereas women more frequently have hypertension, diabetes, hypercholesterolemia and angina. Although women typically smoke less, the relative risk for MI of women who smoke was 1.5 to 2 times greater than of men who smoked, especially in younger age (< 55 years). Higher prevalence of diabetes contributes to higher mortality rates of MI among women. Women receive fewer advanced diagnostic tests like coronary angiography and fewer interventions like coronary artery surgery or percutaneous interventions. This may be due to acute heart attack occurring in women at an older age and other associated diseases, but could also be due to longer delay to hospital admission. Although in 90 percent of cases, women retrospectively admit that they intuitively knew their symptoms were related to heart attack, they may attribute it to something else, take aspirin or just delay calling 911. This decreases chances to preserve their heart from damage caused by circulation blockage and lowers their chances of survival. Symptoms of heart attack in women are most often the same as in men with chest pain being the leading symptom. However, sometimes women attribute their symptoms to acid reflux, the flu or normal aging. 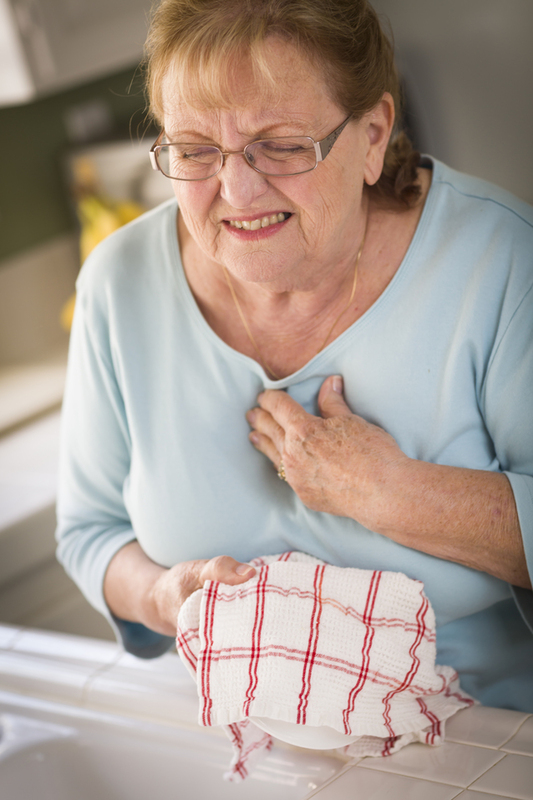 The chest pain (angina) does not necessarily occur in the center of the chest and left arm. Instead, women may feel upper back pressure that feels like squeezing or a rope being tied around them. The following are the most common symptoms of heart attack in women provided by American Heart Association. If you have any of these signs, don’t wait more than five minutes before calling for help. Call 911 and get to a hospital immediately. I had a heart attack this past June at age 38. I had excruciating pain in both of my upper arms (from elbow to shoulder), pain in my left jaw, and nausea. It was unlike any pain I had ever experienced before. Thank you for sharing this article!